Kings of Leon in Montreal or Quebec City? Inform me about the next events for Kings of Leon. Enroll yourself to our priority waiting list for Kings of Leon to be alerted when new tickets are available. Filling this form doesn't engage you to any purchase. American rock band Kings of Leon will return to Montreal on February 24th, 2014 for a concert at the Bell Centre. The last Kings of Leon concert in Montreal was on October 1st, 2013, as part of the NHL Face-Off event, which kicked off the 2013-2014 season of the NHL. Don't miss your chance to see their full arena concert this time around ! 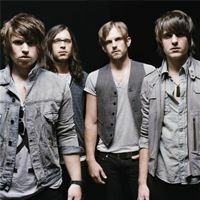 Kings of Leon are arguably one of the best rock bands out there ! You won't wanna miss this!